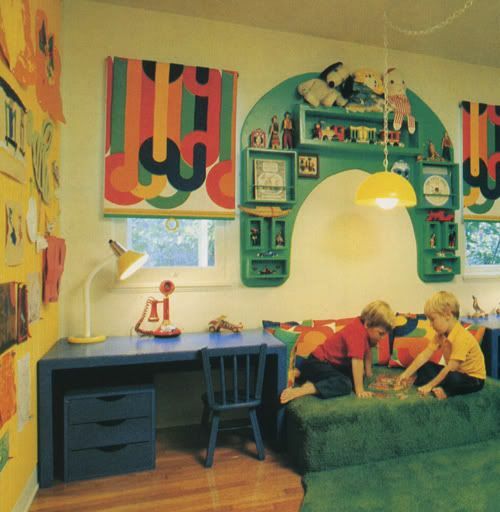 Vintage Kiddo: Kid Bedrooms from the 60s and 70s were swank! Howdy gang. I was cleaning up the house this weekend and stumbled upon my stash of old vintage home interior books—I have a handful from the late 60s and 70s. I love them but I have to be honest, I rarely crack ’em open. 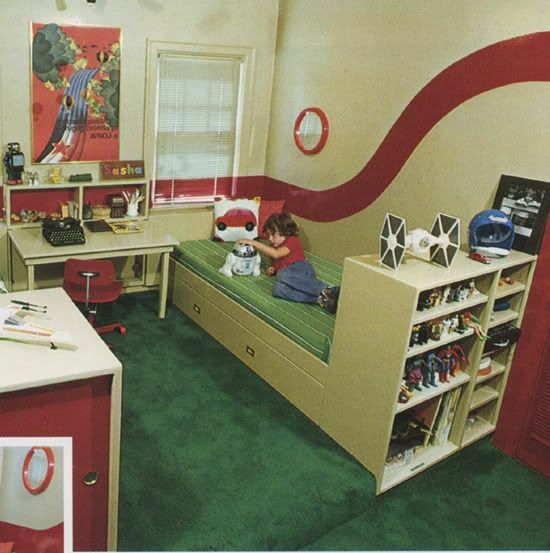 Thank goodness I did, I had totally forgotten about all the amazing kid’s bedrooms in some of them! I thought you guys might like to take a little look-see with me, so after an afternoon with the scanner, here’s what I have for ya. I think you’ll like! Where to begin. 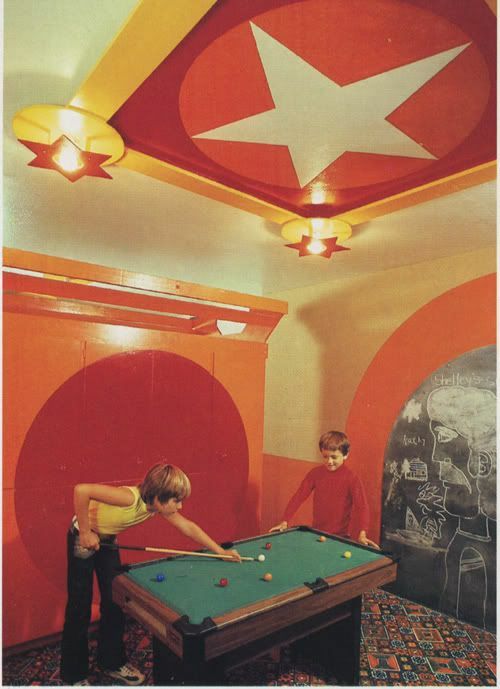 The gigantic star on the ceiling? The ‘stash on that chalk drawing? Wow. I hate to say it, but in 10 years Lance will be driving a Camaro and probably won’t have anything to do with ol’ Todd. But don’t worry…Todd will get his revenge. He’ll invent the Walkman in the 80s and become a digi-mogul. Lance will end up renovating Todd’s rec room. Ahh, Widdle Wednesdays look out! 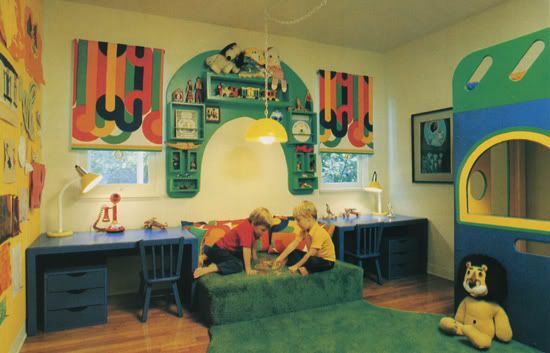 Take a gander at this intriguing retro baby nursery. 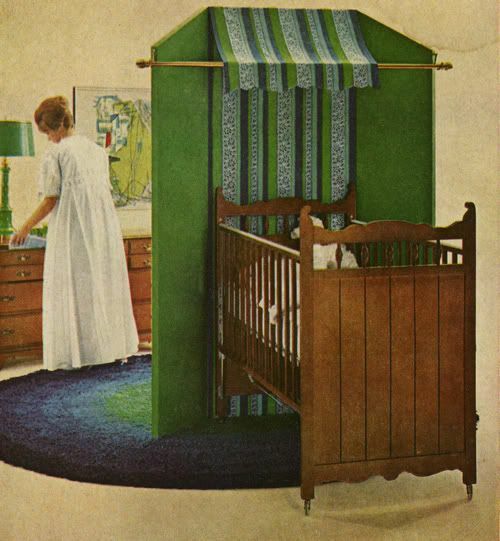 Ahh, the floating wall nursery, with potentially deadly medieval metal pole hanging over bebe’s head. Sweeeet. That rug though…. This next one is amazing. Lots of cool cubby space for hunkerin’ down and reading your best Encyclopedia Brown book. Sigh. I love the wallpaper, the book nook and that aquarium…. I’m crazy about polka dots (although these are a little eye-cross inducing, methinks). 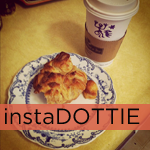 Look how cute that little polka chair is! If this next one looks familiar….it’s because it is! 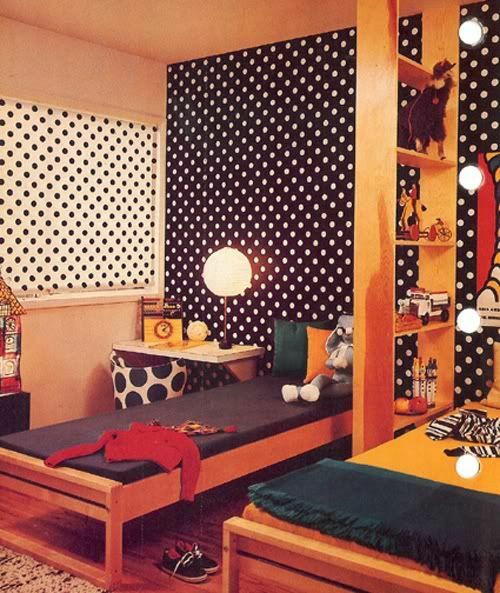 Same polka dot room, but different book! I love the little romper on the boy. Ahoy matey, the S.S. Kiddo is set to sail! 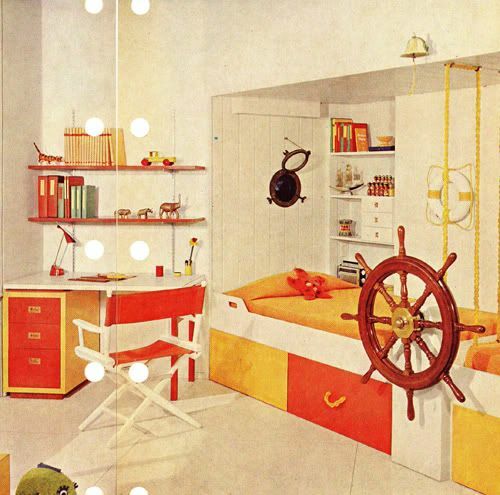 This theme room is amazing….down to the porthole and the bell on the wall. By the way, those white circles aren’t fancy lights. This particular book is a three-ring binder. I was able to crop the holes out of most of the photos but I didn’t want you to miss out on the grandeur of the director’s chair/desk combo. Or that starfish pillow on the bed. Oooh oooh. WHAT IS THAT PEEKING OUT OF THE BOTTOM LEFT CORNER?? I swear it’s like the cousin of mystery red thing on the shelf! OK. Carry on…. Check out this four poster bed. The floral matches the chair AND the hope chest. Wowza! Gotta say I’m highly intrigued by the colossal Fish on Wheels on the floor over there. Overall I think it must be said that the 70s ruled. In addition to bold colors and fun pop stylin’….there was that 1976 bicentennial action that nudged people to go all Colonial. Check out the old-timey phone! 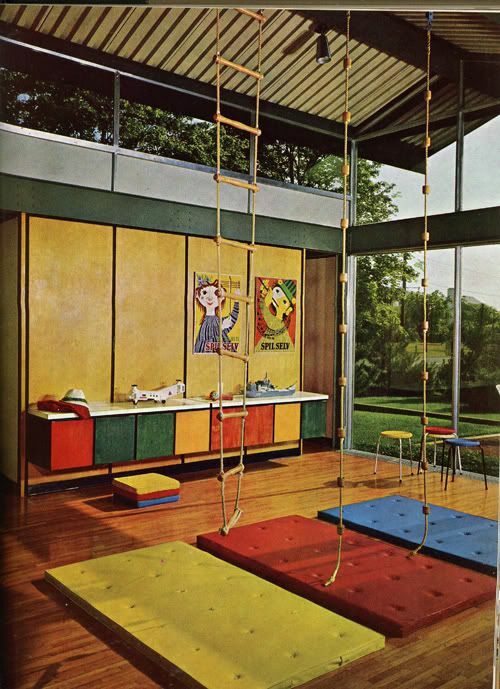 The play space is great in here (and I love those mod window treatments) but wait til you see the bed. How cool is that?? It’s like a double bunk/fort with a build in puppet theater. Looove. This next one is such a creative little space. 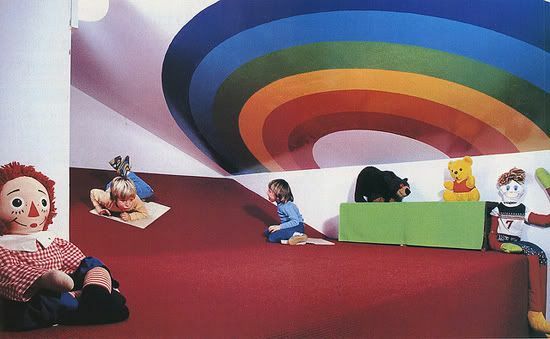 The slanted wall could have felt oppressive, but the big happy rainbow just livens up the whole joint. Next up is Sasha’s pad. And this kiddo is giving Kory a run for the money. I mean the Star Wars Tie Fighter, X-Wing and R2D2…but I’m really digging the color swoosh on the wall….which somehow runs across the window shade, thank you very much. 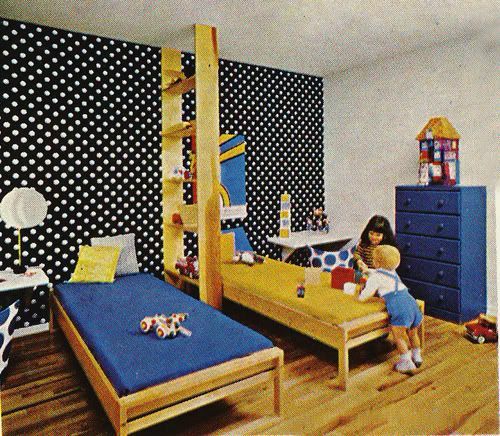 My parents were into Danish modern when I was little—and this was no mean feat growing up in Flint, Michigan, lemme tell ya. 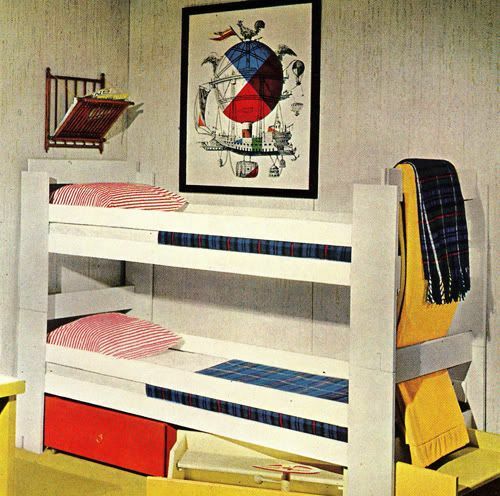 My brother and I had these really cool mod red bunk beds that were a bit like these next ones. There is no ladder, you climb up the slats on the end. Super cool! Alas, ours didn’t come with the head-decapitating magazine rack hanging above the top bunk. And finally….my top favorite. The Indoor Playground. HOW. COOL. IS. THIS. As always, vintage makes me want to embrace color and just kick everything up a notch. I hope you were inspired by these rooms as much as I was. 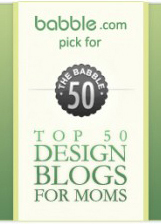 Just promise me you won’t, you know, hang any awkward magazine racks over yer kiddo’s bed, ok? 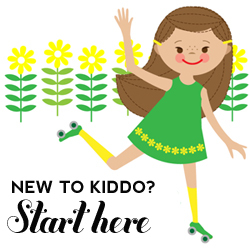 We’re here to inspire, not clock yer sweet pea. 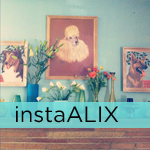 Images: From the collection of Miss Alix. 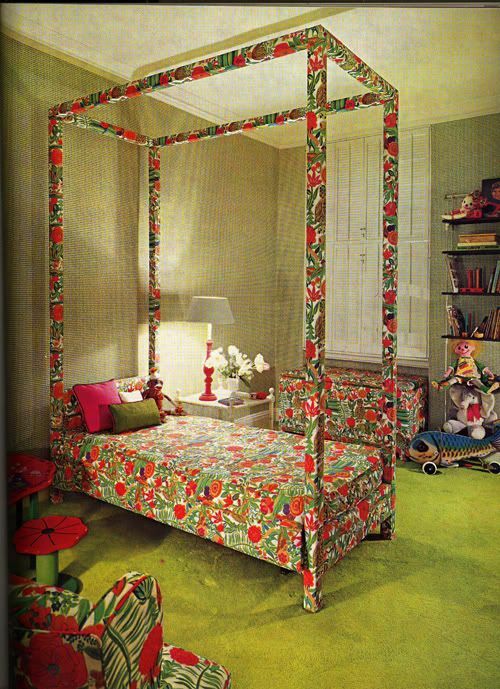 Better Homes and Gardens Decorating book (1968), Better Homes and Gardens Decorating book (1975) and House and Garden’s Complete Guide to Interior Decoration (1970). 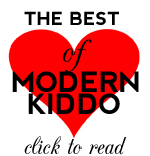 Posted in Best of Alix, Kiddo Rooms. 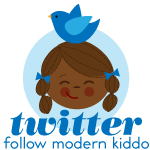 Tagged with vintage baby, vintage kid rooms. fuuuu…. my mind is officially BLOWN. these rooms are incredible! the thing on the top shelf in the room with the yellow swan chair looks like a GONK in had box form or something? awesome town: population gonk hatbox. also, i had a friend who had a ship’s wheel, rope ladder, boat-style bunk bed. its was ace! Awesome Alix! I love these. I can’t pick a favorite yet…. have to go back and study them when I am not so bleary eyed. Again, damn good post lady! Oh, that book nook is to die for – I wish for one of those (and I am approaching 40). gh;ljfds;kf’sj this is so amazing i can’t even type! ps. love the bit about the ‘head decapitating magazine rack’ you are hilarious! 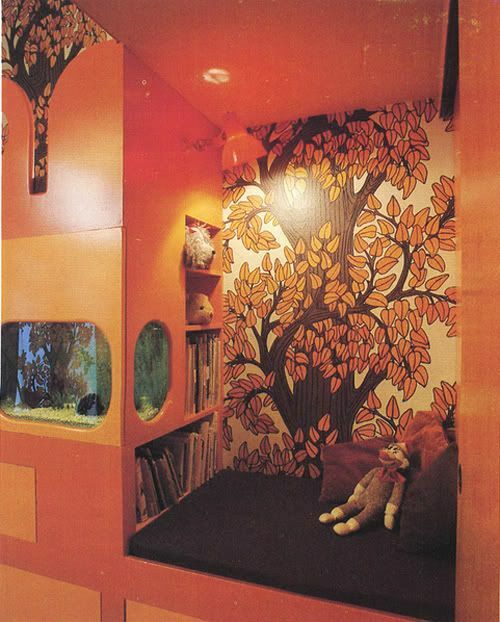 Oh man, I would kill for that orange cubby bedroom, or at the very least the orange tree print on the wall! Love it. I had a couple of those BHG decorating books a long time ago, they were the best!! I’m so jealous of the cool beds, I want to sleep in a pod, too. but. bunk beds = no parent’s friend. changing the sheets + making the top bunk? nothankyou. i am dying, no i am dead, i died. no words. NO WORDS. 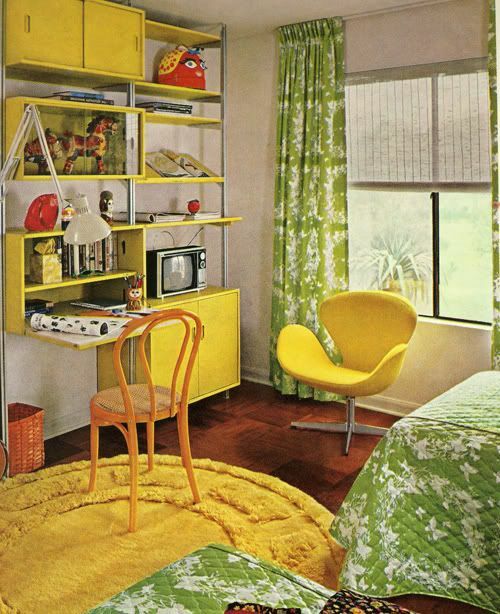 i want that green and yellow room (along with several others)! hair dryer case keeps popping into my head for that thing on the shelf, but i don’t know. ooooh that little orange book nook is fantastic! and i wish i had some of that tree wallpaper for my own room, it’s beautiful. love this post! My mind is cooking a mile a minute trying to figure out how to build a bunk-puppet theater in the hallway nursery. Wow! 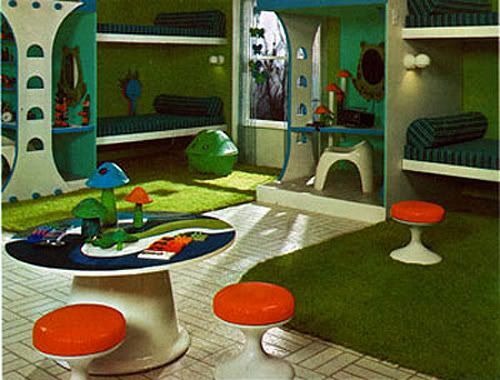 I absolutely love those rooms, especially the mushroom room, it reminds me of the illustrations from my old Alice in Wonderland book! Thanks for this! 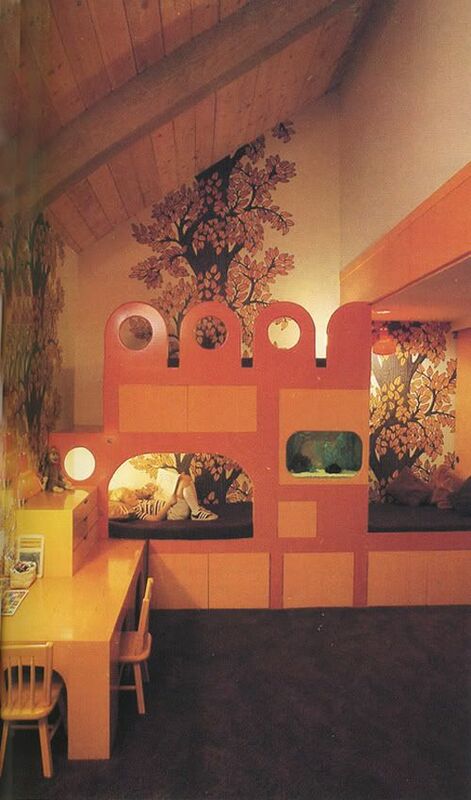 Love the indoor playground and the tree wallpaper is way better than what we see nowadays! Good lord some of those rooms are hard to look at. I would have killed for one of those tube bunk beds though. 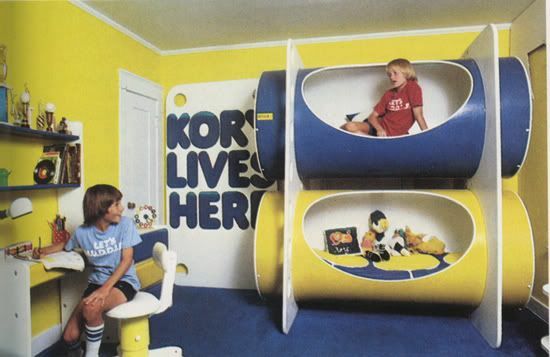 Could we talk about the freaking pneumatic tube bunk beds? Or the Sister Parish trick of using the same fabric all over the room? Kellie: i’ve been obsessing over that red dome thing myself! Tara: Haha. WInnie the Pooh and the bee swarm is cracking me up!!! Poor thing…. OhSydney/Kris: I know, isn’t it cool?? LIke a little fairytale room. Rocket Girl: Maybe a mini pod??? Beth: Hair dryer case??? WOW it totally could be. We had an old one like that, with the puffy shower cap top and the tube that attached!! Lishy: Did you notice my reference to LANCE and TODD??? A valentine’s day throwback! Jenny: OMG tell me about it….I was thinking “I need to scan all these kid’s books and then get rid of most of them! !” We have a Situation over herrrrr. ErinLucy: hee. your comment cracked me up. At first I thought I got some crazy gibberish SPAM! Love it…. OK, I am late to the party, but I think the red top-shelf denizen may be a pop-up hair dryer. Still pretty groovy, regardless of its actual function. So fun to look at! Love that the mom is wearing a “house dress” in the nursery pic…can you imagine? Item on the top shelf looks like a dome/bonnet hair dryer . . . with a face added! Spooky! alix, i was JUST coming back on here to tell you that lance and todd was NOT lost on me! lol!!! oh man, love those two!!!!! I think it’s an overnight bag/hat box type case. If you look at this bag on ebay: http://cgi.ebay.com/VINTAGE-SAMSONITE-ROUND-TRAIN-CASE-HAT-BOX-LUGGAGE-EXC-/130416345096?cmd=ViewItem&pt=Luggage&hash=item1e5d6b8008 you can see the same kind of clasp on the side as there is in the photo and there’s clearly a handle coming out of the head. We used to have a bag similar to that one on ebay but in red and as soon as I saw your photo that’s what it reminded me of. OMG!! LOVING the bed with the 3-way fish tank! And those “can” beds? Freaking AWE SOME! I still have the red and white bunk beds mention here. Sadly the mattresses died and I yet to buy new ones, since I’ll have to special order them. Sheets are also no longer available in the USA store since IKEA stop offering European size mattresses. haha. *ding ding ding!!! * 10 points to RAMON! 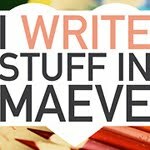 Thank you for compiling this treasure trove of ideas. I came for the climbing rope image and really like many others. The bunk pods of Korey’s are great! We use that tubing all the time for foundation work! Where’d you get the image of the two boys on the green and blue bunk bed? 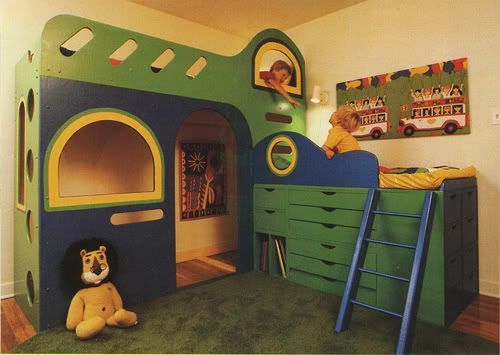 My brother and I had one VERY similar as kids, but ours had a tunnel under the lower bed. 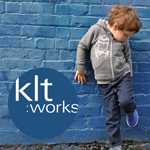 I’m trying to find the source material to recreate one for my son. Any help would be greatly appreciated. These rooms are to Die for. Beautiful!! !